Daytrotter is going back to its roots by free streaming all of its exclusive music sessions after seven years as a membership-based site. Since 2006, Daytrotter has been known as the best place to find your new and old favorite bands. We capture the live essence of artists in our studio in Davenport, Iowa, on analog gear while they’re crisscrossing the country. We’ve recorded all kinds of artists—legendary, emerging, regional, local, bands that fill arenas and bands that play in basements; we cherish and appreciate their music all the same. Over the years there have been changes to content accessibility on our site, and another one is happening today. We are FREE. Free as a bird. Go ahead, type in daytrotter.com, choose a session, click play, and pay not a penny (after reading this announcement, of course). It’s no secret that the world’s music consumption habits are constantly changing, so we’re changing with it. You can now stream audio and video on Daytrotter.com of any session we’ve ever recorded for no charge at all. 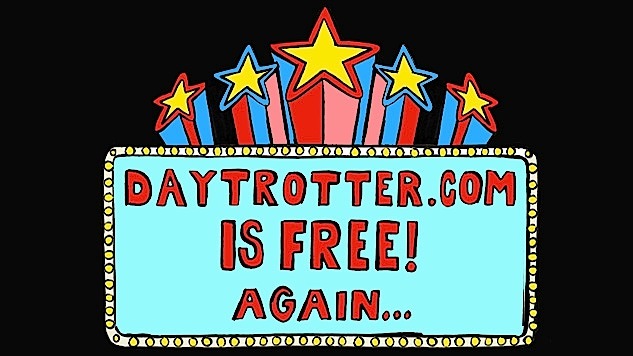 The last time daytrotter.com was free was in 2011, and a lot has changed since then. We’ve recorded thousands of additional artists, relocated to a new studio, opened up a venue here in Davenport, put on our first two Daytrotter Downs festivals, recorded at festivals and studios across the world, and added live-video streams to our studio sessions. We’re excited to move forward with free streaming on our site, but we’ll need your help spreading the word that we’re free again. Share the magic of Daytrotter sessions with your music-loving friends and followers. To get you started with your music discovery, check out this special playlist of our favorite sessions we’ve recorded since the last time we were free, or one of our many other curated playlists. While we have you, you should know that we just announced the brand new Paste Music & Daytrotter mobile app. Download our new app to take the largest collection of live recordings with you wherever you go. If you have any questions about the switch, check out our help page to get your answers. Follow us on Facebook, Twitter and Instagram to stay up to date on who’s in the studio and see behind the scenes of the day-to-day at the Horseshack. Welcome (back) to the free Daytrotter.